Just so you know, I am possibly the world's worst sewer. I'm impatient, inaccurate and messy. I don't like to pin, don't like to use the iron, and don't take time to measure. Plus I have an incurable hurry-up-and-get-it-over-with attitude. But my quilting class is forcing me to abandon my careless ways and now I'm making my first set of nice, neat quilt blocks. You must be kidding me. I love my teacher, and I know I've mentioned her before. Her name is Mabeth. She says things like 'we don't make blankets, we make quilts' and 'we don't iron, we press.' She'll scold you if you don't retract your rotary blade after cutting. She's adorable. The pattern we're doing for class is very old school with traditional triangle and nine square blocks; it's not my favorite style but this is such a great learning experience and I now fear that I'll be reaching for my ruler and squaring up edges for the rest of my life. A new challenge is up today at The Creative Type. Type gone retro. 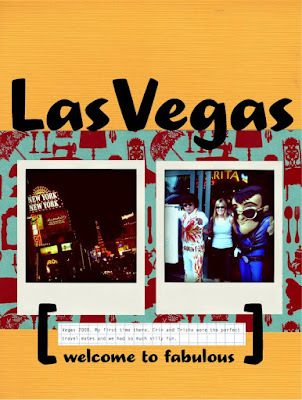 Erin and Trisha and I have been discussing travel destinations for this spring which made me think back to our Vegas trip last summer and what a blast we had. And how nice and warm it was. Actually, hot. Vegas is hot. Get me out of this Iowa snow. I'll go anywhere. omg you just hit every reason why I don't sew roflmbo! NEW York is calling for you to visit!!! 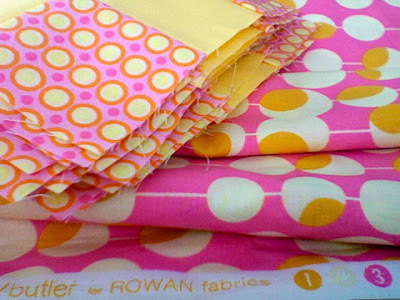 Love those fabrics Jen, cant wait to see your new sewing projects. One day I will make a quilt! (If I say it often enough maybe it will come true...) Look forward to seeing yours finished!